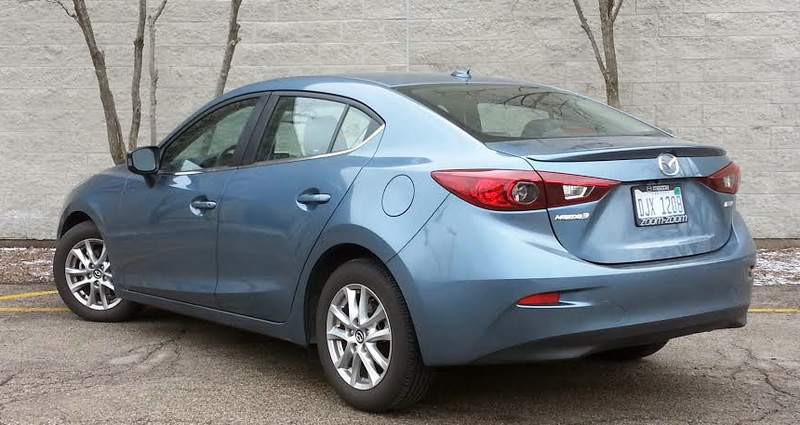 The tested top-line Mazda 3 i Grand Touring stickered for $23,435 including destination, though that was for the manual-transmission version. Adding the 6-speed automatic transmission tacks on another $1050. Big & Tall comfort ratings are for front seats only. "Big" rating based on male tester weighing approximately 350 pounds, "Tall" rating based on 6'6" male tester. Trunk space is quite good to begin with, and the rear seat backs fold level with the cargo floor. However, the opening between the trunk and interior is a bit restricted. Before getting into this review, I’d like to get one thing off my chest. You know that audio system in the Mazda 3? The one with the “Commander Control” on the console? I utterly hate it. Always will in everything Mazda puts it in, even if I like the rest of the car. If it’s easier to write this rant than it is to save a radio station as a preset (and it is), then something’s wrong with the system. Ahh—better now. Thanks for your patience. Consumer Guide® likes the Mazda 3 well enough to have made it a 2016 “Best Buy” in the compact class. One man’s opinion of the audio system aside, that high regard was borne out by CG’s latest test car from this family, a top-of-the-line i Grand Touring four-door sedan. In many ways, it was like the positively reviewed 3 i Touring sedan tested in 2015, but with the Grand Touring’s extra standard features and a different powerteam. Interior materials impress but the audio-control layout doesn’t. Most adjustments — some rather tedious to execute — are made through knobs on the console (hidden here behind the hand-brake lever), with the “reaction” appearing on the dashtop screen. Both cars had the 2.0-liter dohc four-cylinder engine that powers all “i”-model Mazda 3s, a powerplant that makes 155 horsepower and 150 lb-ft of torque. (A larger, stronger engine is found in “s” models.) In place of the 2015 car’s six-speed automatic transmission, though, the Grand Touring was hooked to a six-speed manual gearbox. This driver thought the shifter lacked precision, but the clutch was cooperative, and somebody did a good job of picking out gear ratios that help the car make the most of its modest torque. Takeoffs aren’t flashy, and some downshifting may be necessary to keep the 2.0 happy at lower speeds, but once launched it cruises well enough on the highway. Perhaps it can be chalked up to personal driving style, but my 107.2-mile test drive resulted in fuel economy of 30.85 mpg. The EPA projection for the 2.0-liter with stick shift is 29 mpg in city driving, but my run included just 38 percent city-type driving. The federal figure for this Mazda in highway driving is a stingy 41 mpg. I did quite a bit better—37.66 mpg—with the automatic in 2015. Ride with the fully independent suspension is somewhat firm but damped well enough to handle most jolts. Steering is responsive, and braking is good. Front leg and head room are fine up front, all the more so if you’re south of six feet tall. The standard power moonroof does take up some overhead space. Space is OK for two adults in the back seat, especially if front passengers don’t require all of their available seat travel. Mazda makes this fairly inexpensive car feel somewhat upscale. Seats are covered in leatherette, with leather wrapping the steering wheel, shift knob, and brake handle. Carbon-fiber-look panels on the arm rests house window, lock, and mirror controls. Heated front seats offer good support and grip, and the driver enjoys 6-way power adjustment. Soft-touch material is fairly liberally applied around the cabin. Personal-item storage starts with pockets in all four doors that are just big enough to be bottle holders. The glovebox is ample, but some of the limited space in the cubby under the console armrest is given over to a power plug and media-device inputs. Two open cupholders are set in the console for front-seat occupants, and two more are set in a pull-down center armrest in the back seat. Trunk space, pretty good for a small car, gets even better when the rear 60/40 seats are folded down. While the seat backs fold very flat with an unbroken transition from the trunk floor, a bulkhead behind the seats narrows the opening somewhat, restricting the size of items that can be loaded past this point. 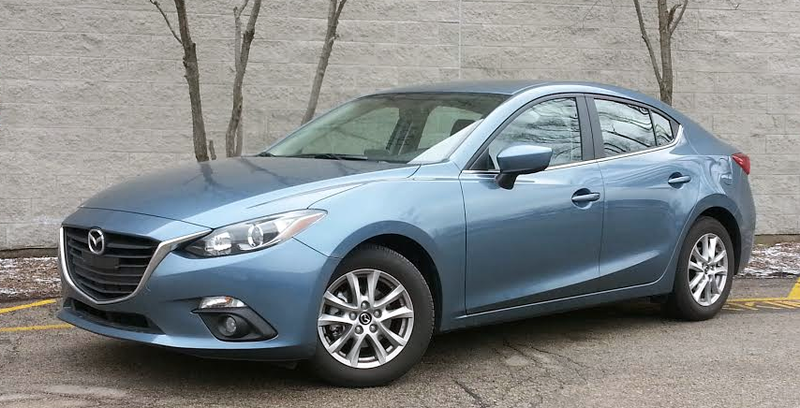 Aside from standard items previously mentioned, the Mazda 3 Grand Touring comes fairly well loaded for a car with a $22,545 starting price. (A hatchback companion costs a little more.) Grand Touring equipment includes a navigation system that displays on a 7-inch screen atop the center of the dashboard, dual-zone automatic climate control, push-button engine start, 16-inch alloy wheels, heated power mirrors with integral turn signals, halogen fog lights, rearview camera, blind-spot monitor, rear cross-traffic alert, Bluetooth phone and audio connectivity, satellite radio, and popular web-enabled entertainment services. With only an extra-cost cargo mat and delivery tacked on, the car that CG tested totaled just $23,435. That’s a great deal that would be even better if you could play the radio. It’s not perfect, but the Mazda 3 comes off as being a strong value for the money. Though the 3’s front row is fairly roomy, the door openings are on the small side, complicating entry and exit activity for larger folks. Written by: The Daily Drive staff on March 8, 2016.on March 10, 2016.